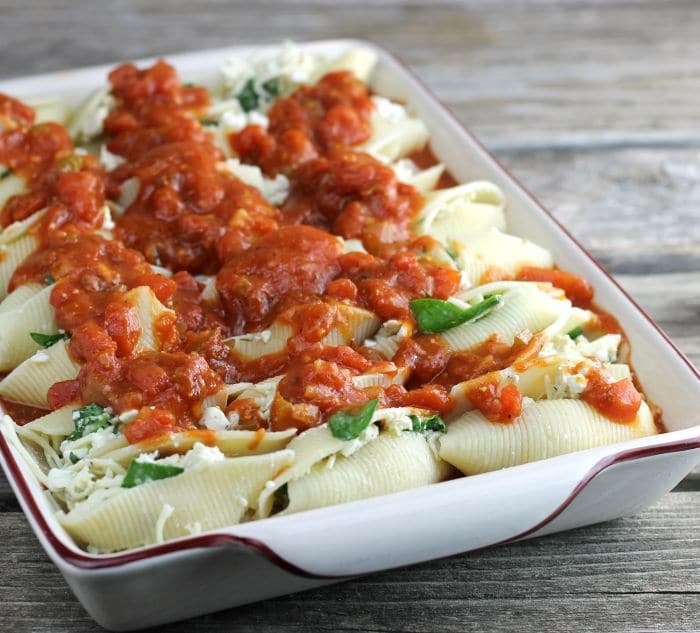 Chicken and spinach stuffed shells is a total comfort food delight. 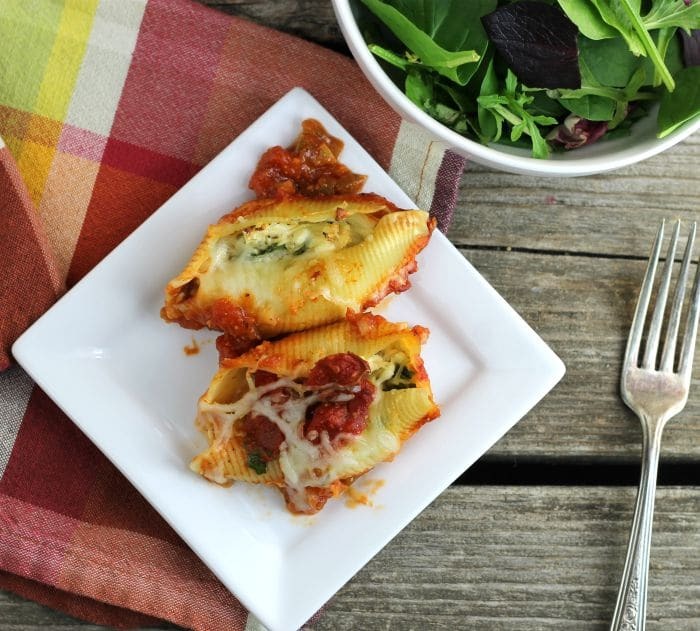 Serve the stuffed shells with a green salad and crusty bread and you have a complete meal. Even though spring and warmer weather are right around the corner we are still in the season of comfort food. Cheesy pasta dishes always makes for the perfect comfort food. Pasta and cheese dinners are always meals that will put a smile on Mike’s face. Making pasta and cheese and then adding chicken, spinach and a homemade red sauce takes it over the top. This recipe can be a bit time consuming if you prefer the chicken filling and red sauce can be made one day in and stored in the refrigerator until ready to use. What are the sauces that can be used with stuffed pasta other than red sauce? 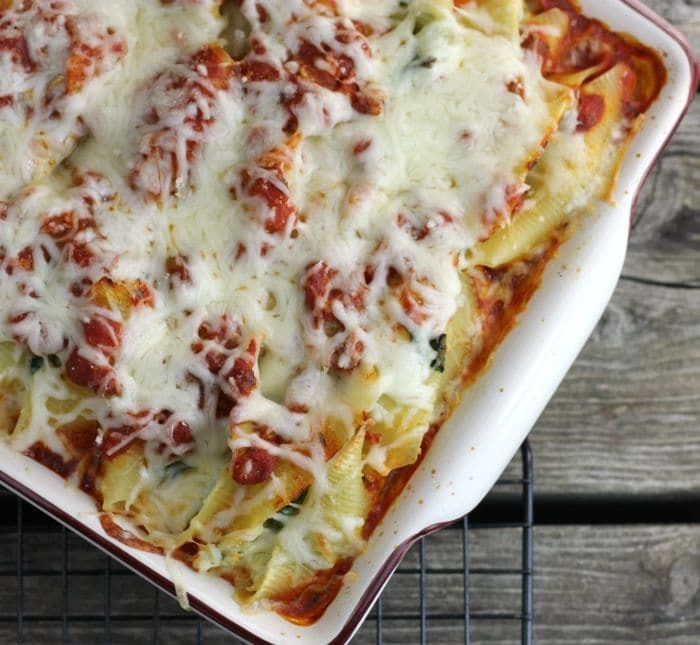 How to heat leftover chicken and spinach stuffed shells? The stuffed shells can be reheated in the microwave. Place the stuffed shells along with some sauce on a microwave dish and cover with plastic wrap leaving one corner open slightly to allow any steam to escape. Heat in short increments and check often to see if the shells are heated through. This looks out of this world delicious! I would definitely come back for a second helping! Pasta is totally one of my favorite comfort foods…and I’m always down for a pasta night no matter what time of the year. This looks amazing, Dawn! I need to make stuffed shells ASAP now! 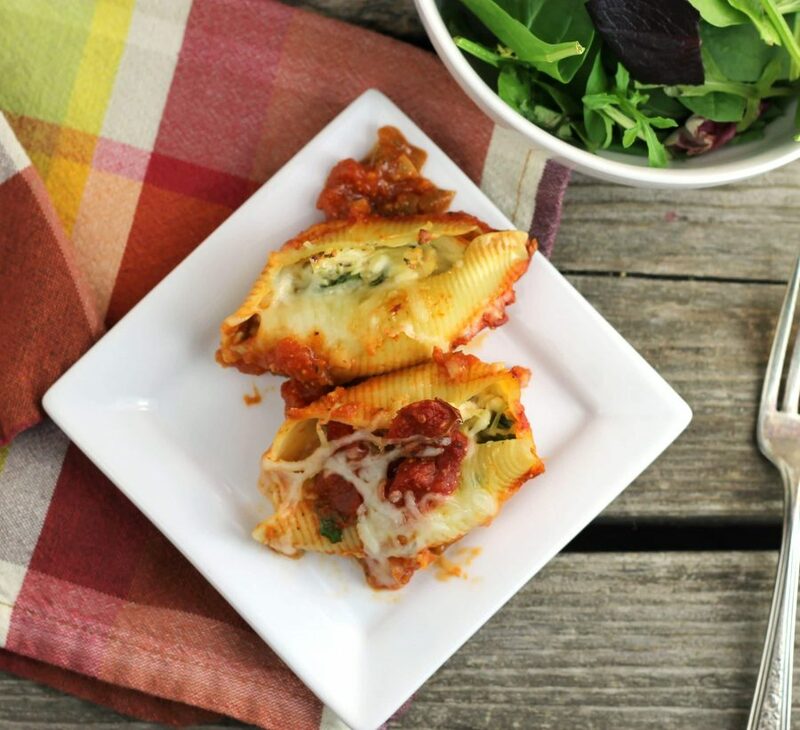 Love stuffed shells and your chicken and spinach version sounds delicious. The shells look delicious, perfect meal for a snowy day like today! Stuffed pasta is so good and comforting, isn’t it? This is a terrific looking dish — always like stuffing shells with, well, anything. And chicken and spinach? Perfect! Good stuff — thanks.